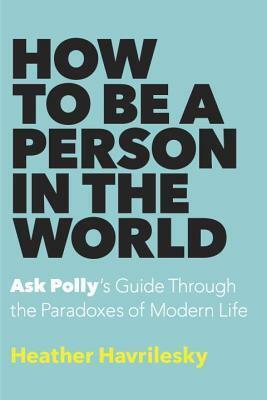 How to Be a Person in the World is a collection of never-before-published material along with a few fan favorites. Whether she’s responding to cheaters or loners, lovers or haters, the depressed or the down-and-out, Havrilesky writes with equal parts grace, humor, and compassion to remind you that even in your darkest moments you’re not alone. I hadn't heard of Ask Polly before, but given my love of Dear Sugar and all things advice column, I knew I'd enjoy this, regardless of the author's voice. I was thrilled to find that I actually identified with Havrilevsky as both a writer and a person, so I found her advice to be both inspiring and beautifully composed. She's simpler in tone than Strayed, who I can't help but compare her to, given the nature of the works, but it agrees with her very well. I preferred the less flowery, effusive tone and the more blunt approach. Definitely an entertaining read, whether you pick it up a chapter at a time or read it all in one go. I liked that Havrilevsky doesn't seem to shy away from making definitive statements and addressing issues with a real opinion. She isn't wishy-washy and she doesn't try to make things as vague as possible in an effort to make everyone feel good. I didn't agree with all of her advice, but I loved the way she delivered it and didn't shy away from hard topics. If you're a Cheryl Strayed devotee, this one absolutely must be on your list. It's such a fun book to read, regardless of how much of the advice you agree with, and Havrilevsky provides a great mix of humor and heart. I highly recommend it.